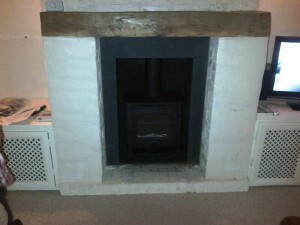 This installation took place in a property in Headley Down, Hampshire. 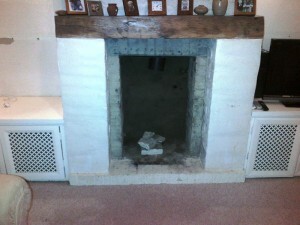 The client felt it was necessary to change their inherited fireplace which was coloured gold! They also decided to go for heat from a stove rather than having an open fire. 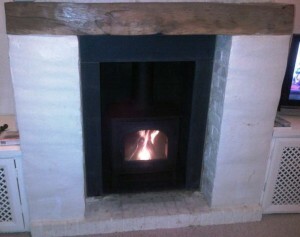 The client chose the Stovax Stockton 7 stove. Once the decision had been made, we then embarked on what we thought was a fairly routine installation; 6m flue run in a 9″ masonry flue. However, as we know in this industry, old houses like to fight back and this one delivered a shocking little surprise. 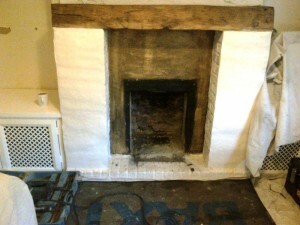 Thankfully though, our client remained very relaxed as the whole room was being redecorated. On investigation, we discovered that the flue had been flaunch half way down and therefore narrowed. Once we broke this away, the liner was then able to complete its descent and we were able to complete the installation process. Finally, we kept the client up to date with all the proceedings and delivered a safe and satisfactory installation.